A fast-paced renovation of this historical space in Shockhoe Slip was a great collaboration with multiple disciplines. 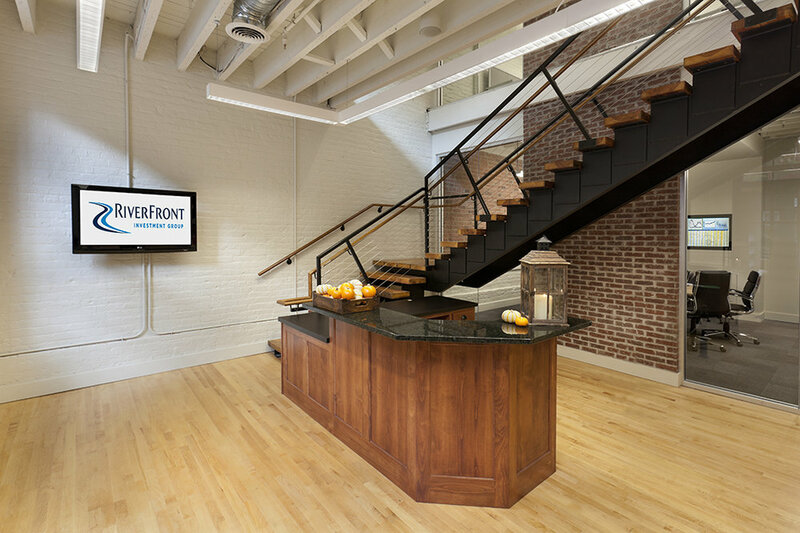 Working with Circle S Studio, Commonwealth Architects and Emerson Construction, the old Richbrau Brewery restaurant was transformed into a stunning office environment for this savvy and fast growing team of Richmond-based investment advisers. Working with their vision and goals for their business, we completely reconfigured the interior of this commercial space to include a reception area, five conference rooms, one large presentation space, and a large kitchen and seating area for entertaining. Cabinetry, countertops, appliances, furniture, desking units and carpet were specified and supplied by Courtney Ludeman Interiors. It was wonderful to have the opportunity to work with this group and turn out an amazing office and reception area which reflects the historical character of this original Shockhoe Slip bay, but whose updates work so well with this smart, fast-growing group of financial advisers. We loved this job and would like to know if you do too! Please let us know by commenting or sharing. To check out more projects please link through our portfolio!